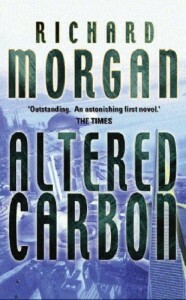 Richard Morgan is a British Science Fiction author whose first novel was 2001’s “Altered Carbon”, a science fiction murder mystery set on Earth several centuries in the future that quickly gained a reputation as a modern classic of the genre. Every science fiction universe tends to have a defining technological gimmick; in this case, it is the use of technology that allows a human mind to be digitised. A person's mind can be captured by equipment implanted in the base of their skull, retaining all of the person’s memories up to the moment of death (assuming that the equipment itself isn't damaged in any fatal incident). It can then be scanned in from the corpse (or from a living person) and transferred or stored like any other form of computer data. If a recently deceased person has enough money he can have his personality re-implanted into a new clone. Rich people also have regular 'backups' taken so that even if their body's own storage is damaged beyond repair they still have a recent record of the state of their mind. The concept makes for a murder mystery with a difference. When a rich and powerful Californian businessman named Bancroft is killed, the police investigation quickly decides that he committed suicide. After his digital backup is installed into a clone body he refuses to accept the decision – claiming that he would never commit suicide and that the police are prejudiced against him. The man he calls upon to investigate the cause of his death is Takeshi Kovacs – a mercenary and former member of the elite UN Envoy Corps, a military unit feared throughout the galaxy for their effectiveness and ruthlessness. Taken out of a virtual prison and beamed across light-years Kovacs finds himself on Earth for the first time. He is faced with the dual challenges of a puzzling mystery and culture shock from the huge differences between Earth and the colony worlds. Kovacs is a very charismatic character, despite his abrasive personality, obvious serious personality flaws and tendency for excessive violence. Many of his actions may be quite well intentioned, but he is a former mercenary with a very murky background and he is quite willing to shoot first (and second, and third and…) and then ask questions later. His investigations soon manage to irritate some of the more powerful locals, and he finds himself the target of assassins. However, Kovacs has an aptitude for combat and anyone who gets in his way would be well advised to have had a digital backup made recently. The supporting characters – such as Bancroft, his scheming wife and the policewoman leading the investigation (who is both a help and a hindrance to Kovacs) – are often intriguing, and although the actions of various characters may sometimes be reprehensible Morgan does provide some explanations for why they act the way they do. The futuristic background is convincing and interesting, and although it has been influenced by past dystopian science fiction and cyberpunk, there is also a fair amount of originality. Like all the best science fiction mysteries the explanation for the crime is inextricably linked to the futuristic technology and society – although it does take a long time for the reader to have any clue about what might be going on. The biggest criticism might be that the plot does seem to ramble a bit, not until the end is the structure of the plot revealed and until then it mainly consists of Kovacs collecting seemingly unconnected leads and engaging in occasional brutal action set-pieces. There’s also a James Bond moment towards the end where Kovacs and the villain discuss the villain’s evil plot for a few minutes instead of immediately trying to kill each other. Early on it is also a bit difficult to care too much about the outcome – the effects of the crime on Bancroft are purely temporary and he isn't particularly likeable anyway. However, as the plot progresses it becomes clear that Bancroft is far from being the biggest victim of the events leading up to his death. In addition to the investigation, we get more than a few flashbacks to earlier incidents in Kovacs' life – from his underprivileged upbringing on a squalid colony world to a disastrous military campaign on Innelin. These flashbacks are interesting, and help to explain Kovacs' unique character, but they do distract from the main plot to some extent. The action sequences are possibly the most memorable part of the book – although anyone squeamish might want to consider reading something else. The action is violent, uncompromising, fast-moving, clearly-described and sometimes more than a bit unpleasant. Kovacs' occasional outbreaks of idealism mean that he ends up being more of a vigilante than an investigator and the fact that some of his opponents are truly despicable does make it easy for the reader to support him, even if Kovacs isn’t necessarily a much better person than the people he is fighting against. In summary, a fast-moving, intelligent, entertaining and ambitious science fiction novel whose only flaw is an occasional lack of focus.